I have been having a lot of fun with then lathe, but it is time to get back on track. I have two new tables that are in desperate need of some sort of accompanying seating. To that end my first run at keeping butts off the floor will be four Welsh inspired stools. I’m lucky in that Chris Schwarz just completed a run of High Staked Stools built in this manner. So he effectively did all of my prototyping for me (thanks Chris!). He worked through several seat, leg and stretcher shapes in his process. His posts about them allowed me to see the forms, eliminate options and firm up my own plans. 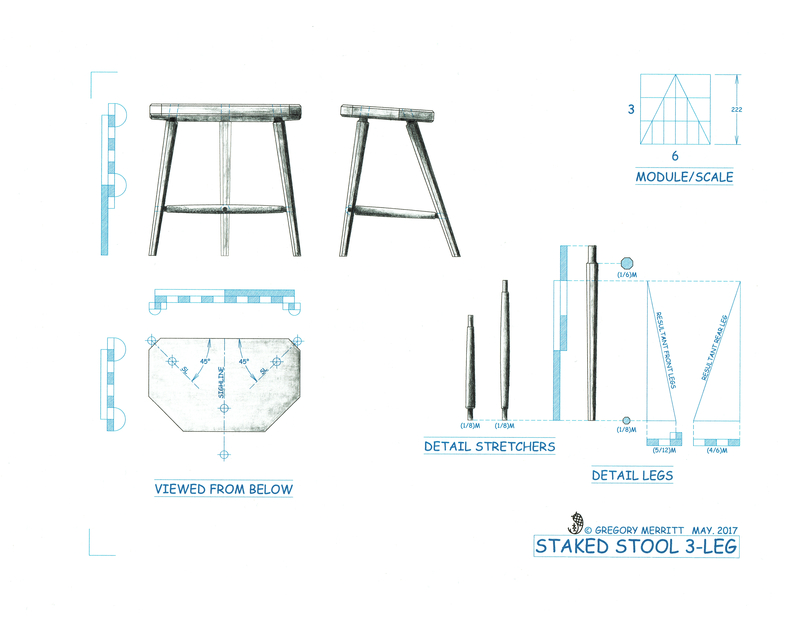 My version will draw visual elements from my tables and will be a couple of inches higher than a standard dinning chair. It has been my experience that stools matching dinning chair height always feel too short in use. There is a delicate balance between seating height, the sitter’s center of gravity and the back of chair. Remove the back and everything feels off. So my stools will be a little higher to try to bring things back into balance (I hope). To finalize my design I worked up a proportional drawing. These four stools will have SYP seats, red oak legs and white oak stretchers. 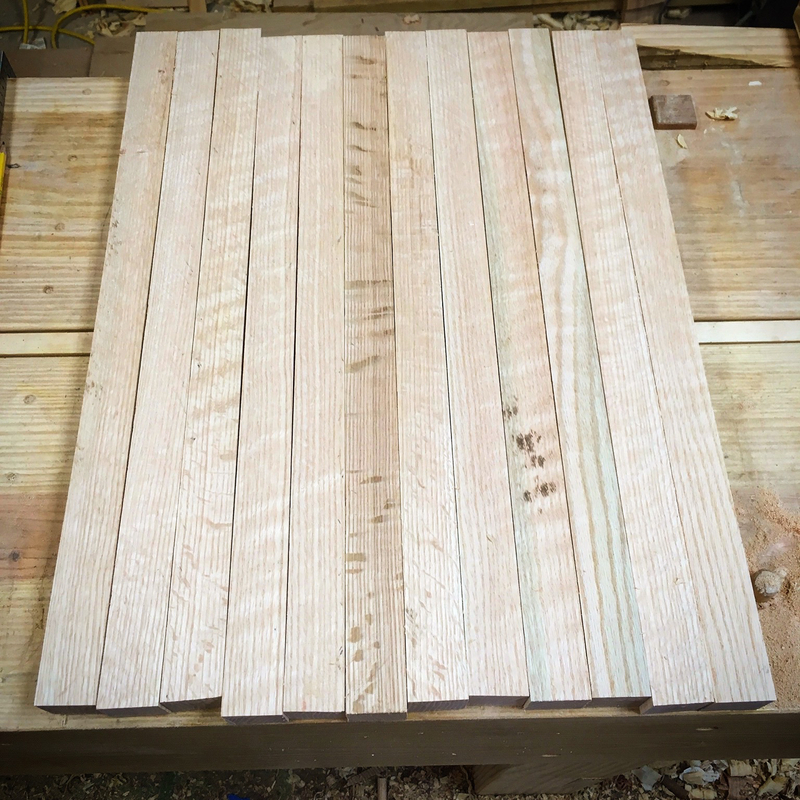 I began by milling the red oak leg stock. Then laid them out to be tapered octagons. 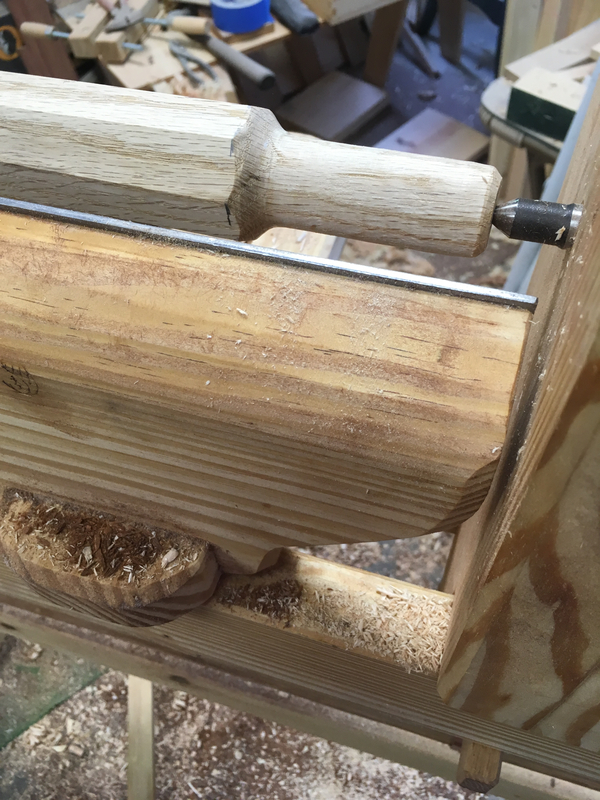 To shape the legs, I first removed the bulk of the waste with a drawknife at the shaving horse. Then refined the octagon with a plane. On all of my previous staked projects I have used the Veritas tapered tenon cutter and reamer. 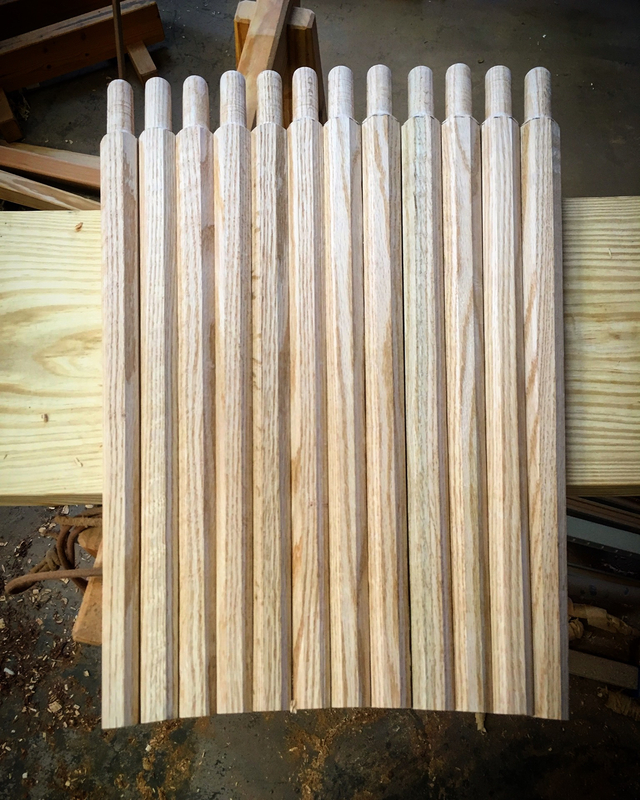 They work well, but I will be trying out a 1″ diameter round tenon method on these stools. From what I can find this method was used by John Brown and was recently demonstrated in Don Weber’s video “Build a Welsh Stick Chair”. 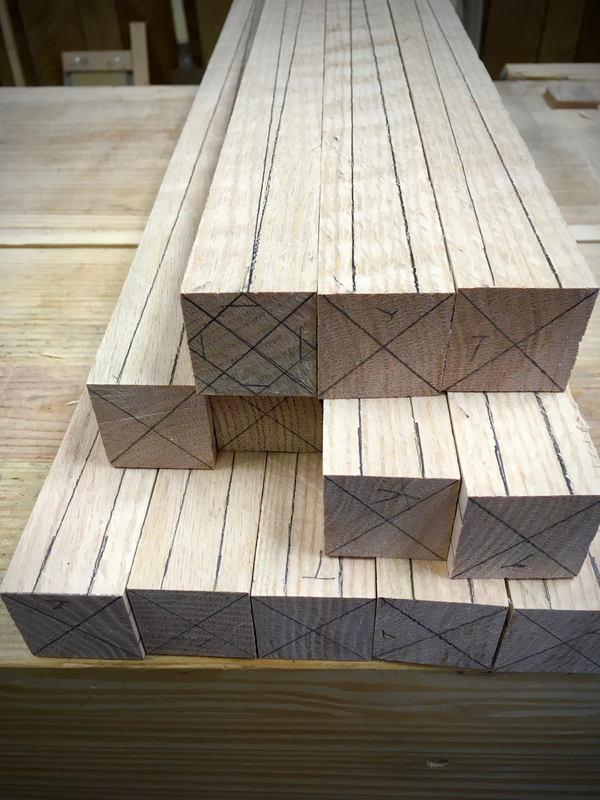 Thanks to the new lathe, creating the 1″ tenons is quite easy. After an afternoon of work, I have all of the legs ready to go. Next I’ll work on the seats. This entry was posted in Welsh 3-Legged Stool and tagged octagonal tapered leg, staked furniture, welsh stool. Bookmark the permalink. The nice thing about making your stools a couple inches higher than a typical chair seat is that you can always cut them down a little if you find them too high. That lathe is really coming in handy, isn’t it Greg? Ha, wish I had built the lathe years ago. I’m surprised how much I enjoy it and how many uses I’m finding for it. I really like the design. They will look fabulous. One thing I saw on some Alpine chairs in Bavaria and Tirol, was the round tenons were wedged with two wedges in a cross shape on each round tenon. It looks really cool, and I imagine very strong. Its always a crap shoot with an unproven design, but sometimes I get lucky. The crossed wedges sound interesting. I’m going to give that some thought. How’s the cord you’re using holding up to all this turning? Have you had to replace it a second time yet? Also, have you considered turning a bowl on this lathe? I’ve heard of folks doing it using custom coring tools. Looks like an interesting process. Thanks for your series on this lathe design, by the way. I am not a hand-tools-only person, but I try to keep minimal shop that can still be efficient. Besides my bench (cheap mdf, but it does the job) the only tool I own but can’t easily move is a 14″ bandsaw, which I love. I’d really like to own a full size lathe, but they are expensive, and are also large and heavy! I will have to move out of the house I’m renting some day. This design really appeals to be because of the low cost and ease of disassembly/transport. I’m basically waffling between making this and buying a harbor freight electric lathe at this point. We’ll see. Glad to hear that you found the pole lathe series useful. The new polyester cord is doing really well. Not even showing any signs of wear yet. Seems much better than the leather cord. I’m sure that I will try turning bowls at some point, but not any time soon. Way too many other projects that i need to get done first. Sounds like the spring pole lathe is a good option for you.